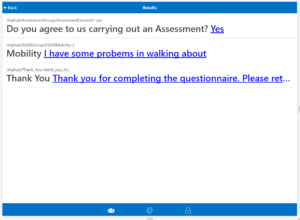 MyCare is a video questionnaire app for new mental health patients who present to the Devon Partnership NHS Trust (the provider of Mental Health and Learning Disability Services for Devon). 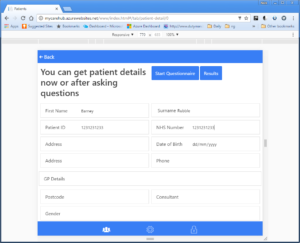 MyCare lets patients take their time over the questions and return a tablet with the answers to the receptionist before they are passed to a clinician to discuss the results. The receptionist sets up the questionnaire on a web site and sets up the clinician login. Then the receptionist, or clinician, chooses the patient on the tablet and hands the tablet to the patient. Questions can have a video or cartoon graphic. When the questions are finished, the results are saved to the web site and database. The clinician can log in to the tablet with a PIN and review the answers with the patient.